Sending smiles from the home front to the war front! 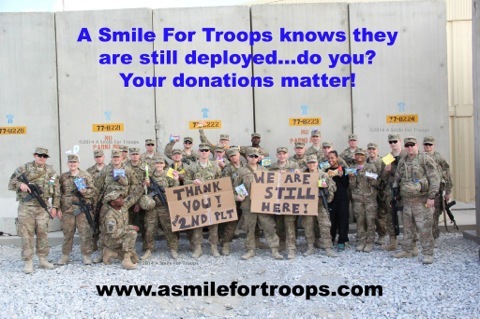 Welcome to A Smile for Troops! Our mission is to provide care packages for deployed service members; our goal is simply to bring a smile to the faces of as many of our nation’s finest men and women as possible. We do this through providing baked goods and other donated items, primarily to troops in Afghanistan. Please visit our What’s Happening page to see what is going on this month! We recently shipped 200 more care packages, bringing the total to over 10,000 since February 2009! We rely heavily on material and financial donations to make these shipments happen, as well as the efforts of a few very dedicated volunteers. Though the economy is suffering, we've still managed to gather enough resources to keep the care packages moving. Being away from one's family is difficult at best and it is easy to feel isolated. The packages help our women and men feel just a little closer to home and remind them that America is grateful for their service.